Udaipur: Hindustan Zinc has qualified for inclusion in “The Sustainability Yearbook”, as Sustainable Leader 2018 (Member). 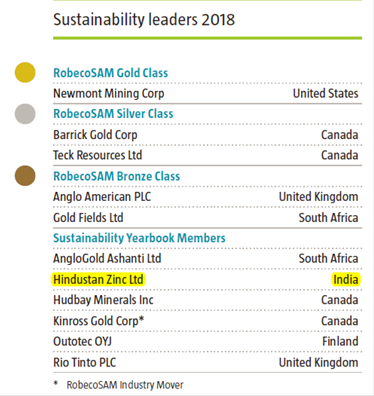 Hindustan Zinc is one amongst the 9 Indian Companies to make it to Global Sustainability Yearbook and the only Indian Company in Metal and Mining sector. Every year since 2004, The Sustainability Yearbook has listed the world’s most sustainable companies in each industry as determined by their score in Dow Jones Sustainability Index (DJSI) assessment (RobecoSAM is the agency who does the assessment). This year 2479 companies in 60 industry sector from 43 countries were assessed and 478 companies qualified for inclusion in RobecoSAM’s The Sustainability Year Book 2018. 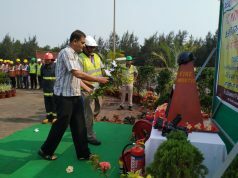 Hindustan Zinc ranked 11th globally with a percentile score of 82 in Dow Jones Sustainability Index (DJSI) and also ranked 3rd globally in Environmental dimension, in the Industry Group – Mining and Metal. Inclusion in Sustainability year book is the matter of pride for us and a recognition of our efforts and initiatives for a sustainable and responsible corporate.